In this interview, history teacher and avid fountain pen collector Rick Propas talks about his evolution as a pen collector, the history of Pelikans, and some of his favorite specimens. Propas runs The PENguin, a website devoted to Pelikans, Parkers, and other German and American pens. 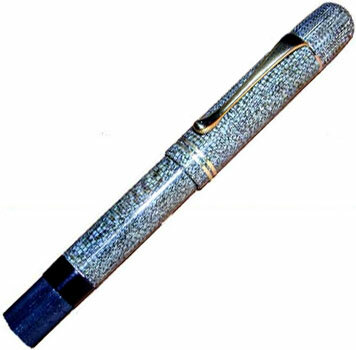 It was back in 1997 that I first got interested in Pelikans. That was in the early days of Internet boards and discussion groups, and there was this big buzz about the modern Pelikan 800. I was really curious about them. At the time, I collected American pens almost exclusively. I was about to turn 50 and I was going on and on about these new Pelikan pens. Finally my wife said, “Well, why don’t you just shut up and buy one?” So I went ahead and bought a Pelikan M800, and I liked it a lot. With its gold overlay and classic styling, the Toledo is considered the emblematic Pelikan. And then people were telling me, “Well, if you like new Pelikans, you’re going to love old ones.” So I bought a bunch from a guy in Europe—a Pelikan 100 was the first—and, as the cliché goes, the rest is history. These days, my primary focus is Pelikans. Vintage pens tend to be rather expensive, so I add the occasional pen here and there. For example, I’m hoping to get a mother of pearl Pelikan 140 some day. I’ve never seen one, and I collect fairly seriously. I’m guessing I have about 800 pens in my overall collection, but my focus is on Pelikans. I have around 200 of those. Probably my single favorite pen is a 1929 Pelikan. It’s a first-year model with a blue-green barrel. Apart from that, the Pelikan Toledo is a great classic, and certainly I use and enjoy that. And then there are my Pelikan 101s in green, blue, and red celluloid. Those are favorites. Collectors Weekly: Do you use most of your pens or are certain vintage ones too valuable? Propas: There’s one pen that I don’t use. It’s actually from the 1950s—a transparent “Demonstrator.” No one’s ever used it, and there’s no particularly good reason to use it now. Other than that, I use everything. Well, not everything, but there’s nothing that’s off-limits. A couple years ago, I would have said the Pelikan 100 is the one I use the most, but lately I’ve been playing around with all sorts of pens. Now, I’d say probably the Pelikan 800 is what I use the most. Collectors Weekly: Can you tell us about the history of the Pelikan Company? Propas: The company was first incorporated in 1838. At that time, they made analine dyes. This was a period in the early 19th century when, for the first time, industrial makers were able to compound synthetic colors and dyes, and that’s what the firm did. They continued doing that and manufacturing office supplies, which is still Pelikan’s business. The first pen didn’t arrive until 1929. The name Pelikan came from the coat of arms of the firm’s modern founder. There was one founder way back in 1838, but later on the fellow who gave his name to the company was Günther Wagner. And the pelican, which is a part of Christian symbolism, was part of his coat of arms. To this day, there’s a pelican on, I think, every pen they make. Collectors Weekly: Why did they decide to start making pens? Propas: I don’t know if there’s a good answer to that, to be honest. Certainly their timing was terrible. But part of it may have to do with the fact that a Hungarian inventor by the name of Theodor Kovacs came to them with an invention for a new filling mechanism, so that might have prompted it. 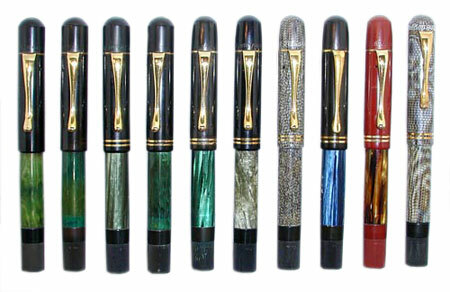 Early Pelikan 100s in various colors, 1929-1934. The early pens had a kind of Bauhaus aesthetic to them. It was strictly form following function. Every design element had a specific reason and purpose for being there. In fact, after the first year, they actually added some ornamentation because the design was deemed to be too stark. But the first pen was just pure function. This is classic German modernism. This is Bauhaus. The people buying Pelikan pens back then were obviously going to be middle class and up. They would’ve been aware of all of these design trends and elements that were percolating across Europe and to a lesser extent across the world. Collectors Weekly: When did Pelikan start adding color to its pen designs? Propas: Well, the first pens did, in fact, have color. Traditionally, German pens had been black. 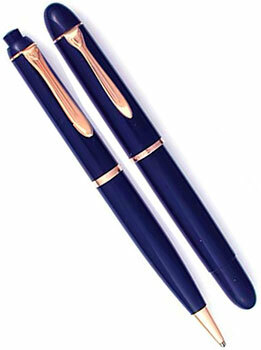 Montblanc was founded in 1906, Soennecken and Kaweco got started even earlier, Osmia was another. For all of them, black was seen as a serious, dignified color, but for reasons that aren’t entirely clear, the head of Pelikan, a fellow named Fritz Beindorff, wanted to make green pens. So, from the beginning, green was the signature color for Pelikan. By 1931, when the pens began to be more successful, they started adding not just more color but also precious metals. They started making pens with gold overlays and white gold overlays, like on the Toledo that I mentioned earlier. So the ornamentation came within a couple of years. To a certain extent, Pelikan opened up the market for a little bit more color in pens, but the more colorful pens always sold better outside of Germany than in. In fact, one of the reasons why Pelikan was able to be so successful so quickly, despite coming into the market so late, was that they had a preexisting worldwide distribution infrastructure because of their artist and office supplies. So they hit the ground running when they started making pens. Collectors Weekly: How were the first Pelikan pens unique compared to those of its competitors? Propas: The main differentiator was the piston filler, which was Kovacs’ invention. That was their big deal. There were a number of different filling systems in use at the time. One involved unscrewing the pen and filling the barrel with ink using an eyedropper. That was the most efficient system. No moving parts, nothing to break, and it had the greatest capacity. The problem was that it was messy. Other systems had been developed, most of them using a sac that is a sort of little rubber tube that would be compressed and then draw ink. But the sac itself couldn’t be filled fully, and it took up space within the barrel. So it was inefficient in that sense. 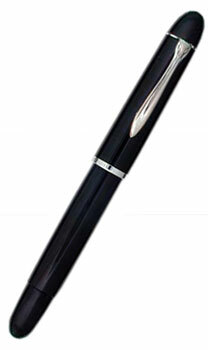 Black pens, such as this 1960s Pelikan 140 with reverse silver colored trim, are very uncommon. The piston sacrificed a bit of area at the end of the barrel, but it filled the barrel directly so that you didn’t have that sac in the way. It was elegant in its application. Very quickly, Montblanc and the other German makers abandoned the various filling systems that they were using and adopted the piston because of its popularity. Collectors Weekly: Did Pelikan always give its pens model numbers? 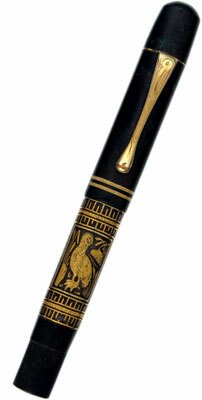 Propas: The first pen was simply the Pelikan. That was it. Then, once they began producing other models, they went back and named the basic model the 100. After that they started spinning off various other numbers. The reason they used model numbers is that the numbers are universal, that is, a Pelikan 100 is a Pelikan 100, whether it’s in India or Latin America. Germans do use design numbers rather than names. Think of the Porsche 911. That was the 911th design project that came out of the Porsche design studios. The Japanese love those fanciful names. You’ve got a car in Japan called the Bluebird—the Germans would never do that. It’s going to be a 100. Collectors Weekly: How many models has Pelikan made? Propas: That’s a little bit hard to answer. A lot. Like any company, early on, they probably had half a dozen models—one basic chassis but with a number of designations depending on the material. The pens all had the same basic lines, the same basic shape, the same basic guts. Then they started adding additional models, so today it’s countless. I’m sure someone in the corporation could tell you how many model lines they have nowadays, but I certainly couldn’t. Collectors Weekly: In the early years, how often did Pelikan come out with a new pen design? Propas: Whenever they needed to, whenever they felt that the market demanded it of them. The pens underwent a sort of incremental process of improvement. In fact, one of the ways that we can date pens is by their features. They didn’t give pens model years in the same way that American pen makers did. The first new model from Pelikan came out in 1937, and it was the Pelikan 100N. The original Pelikan was rather small, so they wanted something a little bit larger. Also, by 1937, streamlined design was coming in—people were moving away from modernism and towards streamline. So the 100N, in addition to being slightly larger, was also streamlined. It was more rounded, less upright, and the pen tapered at both ends. Collectors Weekly: Did the shape of the pens cater to the user’s comfort? 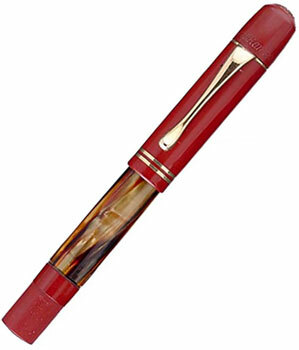 This Pelikan 100 tortoise shell has a red hard rubber cap and mechanism. Propas: Yes. Remember, form follows function. I’m not a designer, but there’s an interconnection there. In a good piece of design, the style and the function are going to be blended. They’re going to be part of the same design process. Collectors Weekly: How did World War II affect Pelikan? Propas: Obviously, World War II had a huge impact on all German industries. You can see a sort of regression in Pelikans during the war years in terms of materials and quality. Finally, in 1944, Pelikan had to shut down. The company reopened in ’47 and redesigned its pen in 1950—it’s essentially the same design that they’re using today in their top-of-the-line pens. It’s like Pelikan’s version of the Porsche 911, a real design that’s been carried forward. Collectors Weekly: So would you say Pelikan’s heyday was the postwar period? Propas: Yes, probably from 1950 to 1956. The model that carried them was the 400 and its variants. That pen was the most fully developed writing instrument at that point. The materials were modern. Germany and Europe as a whole enjoyed a tremendous rebirth after World War II, and there was infrastructure in place, fueled by the American Marshall Plan, that allowed German firms to achieve their greatest designs. Think about the Volkswagen, Porsche, and the rise of BMW, which first came to prominence during this period. Think about Mercedes-Benz. Pelikan was part of that. Collectors Weekly: When did people start collecting Pelikans? Propas: Well, that’s really hard to say. It depends on how you define a collector. Some people argue that if you have two pens you’re a collector because it’s one more than you need. There are definitely more people collecting pens now than in the 1930s. As a hobby, pen collecting began to take off in the period from the late ’60s through the 1980s. I guess it was sparked by bored and affluent baby boomers. There are collectors throughout Europe, particularly in southern Europe, Latin America, and throughout the Commonwealth, although not in England. There are lots of pen collectors in India, Australia, and New Zealand. There are relatively few collectors of Pelikans in this country because they’re not so easy to come by. Before the 1960s the company didn’t export much to the United States. We had restrictive tariffs and we had our own pen industry. Collectors Weekly: Who was at the forefront of the American pen industry? Propas: Generally speaking, it was the big four for American pens—Parker, Sheaffer, Waterman, Eversharp. They were all competing against each other, both aesthetically and in terms of design innovations. Parker, Waterman, and Sheaffer still exist, but large conglomerates own them today. Collectors Weekly: Getting back to Pelikans, what types of materials did the company use over the years? Propas: The basic materials have changed a lot. In the very first Pelikan, the barrel material was made out of Bakelite. From there they switched to celluloid, which was a nitrocellulose. During World War II, the pen bodies were made of acrylics. Pelikan still use acrylics and celluloid today. The decorative barrel band on the pen is still made of a celluloid compound called cellulose acetate. Although the most typical material for pens nowadays is acrylic resin, Pelikan still uses this celluloid band over the acrylic barrel as a decoration. Collectors Weekly: Who are some of the people associated with the craftsmanship and design of Pelikan pens? Propas: For the most part, Pelikan’s designers and engineers are unknown. There weren’t star designers like in cars, where you can talk about Chris Bangle designing BMWs. People like that aren’t widely known within Pelikan, or any other pen company, for that matter. Collectors Weekly: What models are most sought after by collectors? Propas: Actually, the ones I named as my favorites, the first-year Pelikans. The Pelikan Toledo is probably the ne plus ultra, sort of the emblematic Pelikan. And then there are precious metals pens, the ones in solid or white gold, as well as the colors. Their colors were pretty limited. Most Pelikan pens were made with a green marble barrel band, as well as blue, red, brown, or yellow marble, plus tortoiseshell. For colors, they only made red, blue, green, lizard, and tortoiseshell-patterned celluloid pens. Collectors Weekly: Do you try to collect all of the colors in a certain model number? This Pelikan 400 Demonstrator is from 1953. Propas: Yes. It’s hard to do; otherwise everyone would do it. It takes work and application, it takes knowledge, and it takes a certain amount of money, obviously. But knowledge about the pens is just as important—where to seek them out, who to buy from, as well as who not. Many of us try to avoid eBay. The best sales are person to person through a network. If somebody in Germany comes up with a certain obscure model, they will send me an email. That’s the way the best pens change hands, just privately and quietly. Apart from that, there are pen shows around the world. Shows are the marketplace where people meet to buy and sell pens. Collectors Weekly: What are some of the more esoteric Pelikan colors? Propas: The grays are somewhat uncommon. Tortoise shell and lizard are both valued and somewhat more obscure. I would guess that in this country there are maybe only a dozen blue Pelikan 101s, certainly not more. Many advanced collectors don’t have it. It’s a very difficult pen to find. I never thought I’d own one, and then one day it came along. With Pelikans, the big deal is the color of that celluloid barrel band, plus the condition. The same pen in good condition as opposed to terrible condition can be worth twice as much. I’ve spent a good part of my collecting effort cultivating contacts and connections, so it’s not terribly difficult for me to find pens in good condition. And of course whenever I get anything that I don’t need, I pass it along to my clients. I do buy, sell, and trade. Collectors Weekly: Was Pelikan also well regarded for its nibs? Propas: Yes, Pelikan nibs are generally considered the best writing nibs in the business, and that’s from 1929 to the present. It has to do with the shape. The grind on the little iridium tip at the end of the nib, which is actually what you write with, there’s just a Pelikan feel to them, and they’ve been successful in carrying that through for more than 80 years. I could probably put two pens in your hands, one from 1929 and one from today, and you might not be able to tell the difference, particularly if the modern one had been customized to write like a vintage, which is something lots of people do. Collectors Weekly: How did Pelikan respond to the invention of the ballpoint pen? A blue Pelikan 140 pen and pencil from 1952. Propas: They almost lost it, just like everybody else. Those who didn’t lose it struggled to adapt. The advent of the ballpoint pen changed pen manufacturing, but nobody recognized it for about 20 years. Suddenly the fountain pen was no longer an everyday object. It became a luxury object, and pen companies were slow to realize that. Pelikan started making ballpoint pens rather late and rather reluctantly. Most of the firms that aren’t around anymore are those firms that didn’t move fast enough. At first, a lot of fountain pens just went into drawers or the garbage. People simply stopped using them. So, the introduction of the ballpoint certainly caused the loss of a lot of fountain pens, but I don’t think the obsolescence of fountain pens necessarily made them more desirable, at least not in the beginning. Nowadays, using a fountain pen is like shaving with a straight razor or driving a manual transmission. It’s something almost self-consciously atavistic. You make a decision that you’re going to write with a fountain pen rather than with a disposable. It’s an entirely different experience. In fact, many contemporary pens are not intended for use. They’re 100 percent bling. A lot of them you wouldn’t even carry in your pocket. They come with massive display cases, and they’re meant to sit on your desk to impress visitors. There’s a whole world of collecting modern limited-edition pens. In fact, for a little over two years now I’ve been working with the auction house Bonhams, and we’ve built a very significant aftermarket in modern, limited-edition fountain pens. Collectors Weekly: What advice do you have for someone who’s new to pen collecting? Propas: Use them. Enjoy them. Take care of them. Also, be aware of where you’re going, what you’re planning to do, and whether the pen in your pocket is appropriate for that activity. This week, for example, I’ll be flying to New York, and I’ll have a pair of titanium pens in my pocket because they’re almost impossible to destroy. I certainly would not fly, for example, with one of my vintage Pelikan 100s in my pocket. Similarly, when I start a new semester of teaching and I know I’ll be signing lots of forms, I carry something fairly rugged. Later in the semester, if I don’t think I’ll be using my pen too much, I’ll carry something nice, something cool that I just feel like having in my pocket. The Pelikan 101 in lizard. In terms of resources, the Pelikan website is really helpful because it includes some good history. The company doesn’t sell older pens, though. They’re selling only what they produce now. For information about vintage Pelikans, a fellow named Martin Lehmann has written the definitive book called “Pelikan Schreibgerate.” And in all immodesty, my website provides a great deal of information, as well as sales. Collectors Weekly: Is there anything else you’d like to say about pen collecting? Propas: I think that probably the best aspect of pen collecting is the people. In all honesty, over the previous 25 years, a lot of my very closest friends are people whom I have met while collecting pens. The pens are great; don’t get me wrong. I love them and I use them. A friend of mine said that when I’m talking about pens I’m the happiest she ever sees me, but the community is probably the best aspect of this hobby. Collectors Weekly: Thank you, Rick, for talking with us today about Pelikan pens. You have discussed various models of Pelikan fountain pens, but you have failed to recognize the greatness of th Pelikan 60 pencil of which there seem to none in existence. Is it possible to locate one with its original box and in mint condition? I would say that Pelikan 60 was a pencil much much ahead of its times and technologcally the finest ever made. Soora, you are right, my discussion has focused here on the fountain pens. Certainly the Pelikan 60 is one of the most interesting mechanical pencils ever made. They are around and one does see them from time to time with their clear topped red “coffin” boxes. If you are interested, contact me through my website and I may be able to help. It sounds like you have a Pelikan 520, gold filled (as indicated by the double). If you contact me at rickpropas@comcast.net with an image I can tell you more. I have a Pelikan 60 pencil and a Pelikan fountain pen from the same time period. My husband (a German citizen) was given these items as a birthday gift. The pen has a different barrel from the pencil, so they may not be a set. The pencil is solid dark green. The pen has a dark cap and a green barrel with black stripes. There is an unusual marking on the top of the cap of the pen. My grandson is interested in the origin of these pens. Any information you might have would be appreciated. The pencil, commonly known, as a Knickebein (or bent leg) is unique for the mechanism, since it advances the lead by bending in the middle. You are quite correct that it is not a match for your pen, but is a most interesting example of modernist design. The pen is probably more common, especially as those green striped were a signature for Pelikan following World War II and are used by them to this day. Rick Propas is the most honest man in the buisness, i could buy a pen from him blindfolded and come out a winner! I have my grandfathers Pelikan Graphos pen. It is in it’s original leather covered wooden case. Is there anyway I can find out when it was produced?